You will find in this category our Discovery Packs to test a multitude of flavours at a small price. 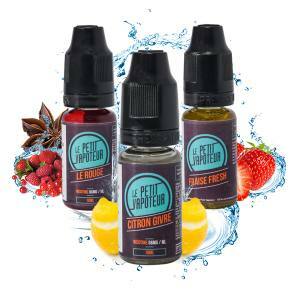 Our Discovery Packs propose a choice of diverse E Liquids with a panel of best flavours for the Electronic Cigarette. Ideal to discover the Electronic Cigarette or re-discover a range of Le Petit Vapoteur Discovery Packs addressing vapers of all levels. Guanabana, Subzero and Bloody Summer, a very strong Fresh Pack ready to give you the shivers. Kanzi, Dragon and Lemon Tart... Benefit with a Fruity Pack at a reasonable price.